The interior has been recovered with Genuine young leather, The carpets were also replaced with a sound deadening underlay (Dyno Mat) which was also fitted to the doors as well. The interior refit cost in the region of £3,500. Within the last 5 years it has had around the £14,000 pounds spent on it as listed above. The Valve stem kit was fitted at the Mercedes Specialist the SL Shop because of signs of blue smoke. The Valves were renewed and it still smokes a bit, We think it is the piston rings now we have counted out the valve stems. We are selling the vehicle as it is as a trade sale. The car runs and drives great, starts up first time but does smoke. The car has had a small fortune spent on it in the last few years and all the niggly bits have been sorted. These R107 SL’s are increasing in value and i would definitely see this to continue in the future. It would make an excellent investment for someone. 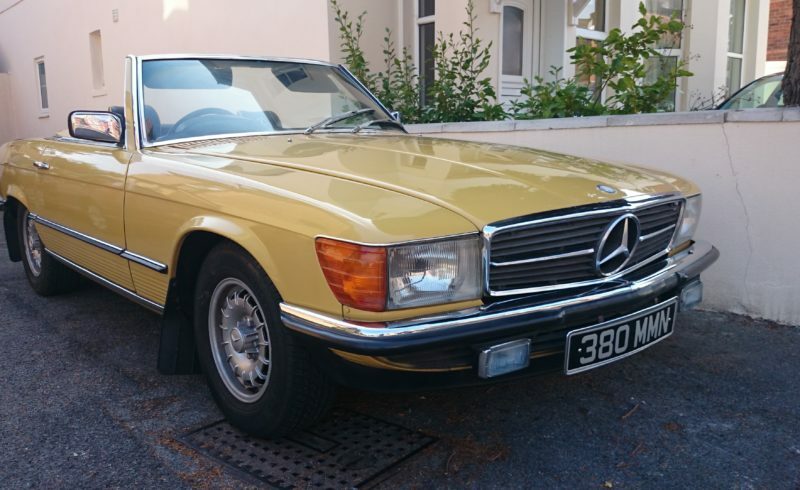 This is the very rare colour, not many left on the road now. Professional classic car Valuation from 2003 for £8,000 with certificate, which we estimate now to be worth in the region of £12-14k with the piston rings replaced. Offers invited, This is a very clean car with only a couple of minor scratches. It has lovely straight panels and shut lines, Well worth a look! !